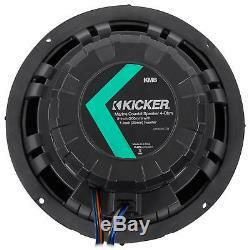 Package: Pair of KICKER 43KM84LCW 8" 600 Watt Marine Speakers with LED Lights + Pair of Kicker 43KMTES8B 8" Marine Speaker Wakeboard Tower Enclosures in Black. Condition: BRAND NEW IN ORIGINAL PACKAGING. 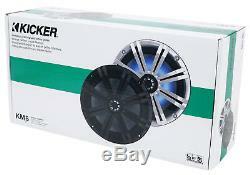 (1) Pair of KICKER 43KM84LCW 8 600 Watt Marine Boat Speakers w/ LED Lights. (1) Pair of Kicker 43KMTES8B Black Marine 8 Speaker Wakeboard Tower Enclosures. KM coaxials are designed specifically for boat audio with weather-proof qualities that meet or exceed industry standards. Grille Options These bold, stylishly designed coaxials come packaged with easy-to-match charcoal or white grilles for a customized look. Multi-Color LEDs These coaxials will brighten any boating experience with multi-color LED lights that can be changed to fit your mood or craft. Twenty color options as well as 19 dynamic modes are available when using the optional KMLC remote. UV treatments on the coaxials' injection-molded cones, Santoprene® surrounds, baskets and grilles help all models maintain in marine environments. These speakers can endure almost any weather conditions with splash-and-spray-resisting sealed motors, cones and locking terminal covers. Speaker hardware is forged from rustproof, 316L stainless-steel. Spectacular Highs Spectacular highs and midrange sounds coupled with the simplest of speaker installations, provide full-range audio specifically for a marine environment. Optional LED Remote Customize your LED lighting to get the perfect look for your boat. The KMLC remote provides multi-function control of LED lighting by managing 20 different colors and 19 dynamic modes, including adjustable brightness, fade, speed/strobe and auto save. 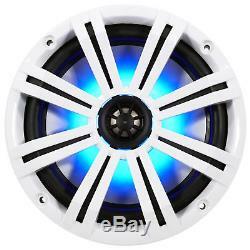 Pair KICKER 43KM84LCW 8 600 Watt Marine Boat Speakers w/ LED Lights. Woofer(in, mm): 8, 200. 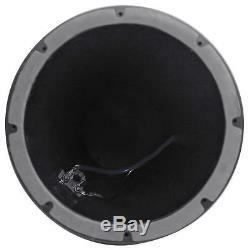 UV-treated polypropylene woofer with Santoprene rubber surround. 1-1/4 balanced dome titanium tweeter. Built-in LED lighting with 20 color options and 19 dynamic modes. Optional KMLC remote controls all lighting functions. Sealed motor structure and locking terminal covers. Stainless steel mounting hardware included. Mounting Hole Diameter(in, mm). Three sizes of mounting adapters for the most popular pipe diameters (2-1/4, 2-3/8, 2-1/2). Mounting KICKER 8 speakers for external listening in marine and powersport applications just got easier with KICKER's durable and weather-proof KM-Series Tower-Speaker Empty Enclosures. Bold With its bold cosmetics, the black KM enclosures with contrasting accent details complement KICKER's 8-inch coaxial marine speakers. Aim to Please The enclosures were designed with a nine-degree axis rotation in either direction, allowing the speaker cans to be aimed in the most desirable location to deliver maximum sound quality. 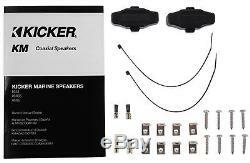 Pair Kicker 43KMTES8B Black Marine 8 Speaker Wakeboard Tower Enclosures. Materials: Tough ABS, weather-proof empty enclosures with slotted mounting holes for different bolt patterns. Aiming: Nine-degree axis rotation in either direction for aiming maximum sound quality. Fits Mounting Tube Sizes: 2-1/4, 2-3/8, 2-1/2, 2-5/8. Connectors: Satin nickel plated brass binding posts (screw to tighten style). If your item is defective within the first 30 days of when it was delivered to you; you have the following options. We will send you a. To replace the item for a brand new one. If you want to return your item within the first 30 days of when it was delivered to you; you have the following options. This includes blown speakers with burned voice coils. The item "(2) KICKER 43KM84LCW 8 600 Watt Marine Boat Wakeboard Speakers with LED Lights" is in sale since Sunday, January 28, 2018. This item is in the category "Consumer Electronics\Vehicle Electronics & GPS\Marine Audio". The seller is "audiosavings" and is located in Inwood, New York. This item can be shipped to United States.